From 2012 to 2013, the M23 rebels became the Democratic Republic of the Congo's most powerful rebel group in recent history, establishing military control over a major city in country's east. You may have heard how M23 was defeated suddenly in late 2013, but do you know what territory they controlled while they were active? Learn more with this exclusive map of M23's territorial possessions over time, as well as a primer on the group's short history and ultimate defeat. Map by Evan Centanni (all rights reserved). The Democratic Republic of the Congo - formerly known as Zaire - has been at war for decades. After serving as the stage for a regional conflict partly sparked by the Rwandan Genocide in the mid-1990s, as well as a follow-up war spanning officially from 1998 to 2003, the eastern DRC has become the stomping ground of dozens of rebel groups with often-shifting allegiances. The March 23 Movement, better known as M23, only appeared in May of 2012. However, it quickly became the most prominent of the many rebel forces operating in the region, carving out its own area of territorial control and proving a match for the Congolese army. In late 2012 it captured Goma, a city of one million and the capital of Congo's North Kivu province. It was eventually crushed in a rapid military campaign by the army and a UN peacekeeper intervention brigade in November 2013. M23's members were mostly Tutsis, from the same ethnic group as the current government of Rwanda, and many of them probably fought on that country's side in the two regional wars. After the second war ended in 2003, many joined a group known as the National Congress for the Defense of the People (CNDP), which rebelled from 2006 until March 23, 2009, when it signed an agreement to be integrated into the Congolese national army. Three years after their integration, about half of the ex-CNDP members defected again, naming their new group "M23" in reference to the March 23 agreement, which they argued the national government in Kinshasa had broken. The rebels' territory reached its greatest extent in late 2012, when they rolled almost unopposed into the provincial capital of Goma on November 20. By this time, they already held Rutshuru, the largest town immediately north of Goma, as well as the Bunagana border crossing with Uganda. On the northern front, they had extended their control as far as the towns of Mabenga and Nyamilima, even briefly reaching the more distant Ugandan border town of Ishasha according to some reports. After taking Goma, they extended their control east through Sake and south along the road to South Kivu province. Based on the terms of an internationally brokered agreement, M23 pulled back out of Goma and Sake at the beginning of December 2012. The next several months saw little conflict with the army, though infighting among the rebels resulted in the expulsion of a faction loyal to alleged war criminal Bosco Ntaganda, who then unexpectedly turned himself in at the US embassy in Rwanda. By summer of 2013, fighting with the government had ramped up again. Though M23 initially had maintained positions just north of Goma, they were slowly pushed back with the help of a newly-authorized "intervention brigade" within the DRC's UN peacekeeping mission. By the end of August the army had retaken the Goma-Rutshuru road as far as Kibati, with M23 forces retreating towards Kibumba. At some point the rebels appear to have abandoned their northern territories in Mabenga and Nyamilima as well, though it's unclear exactly how and when that happened. Another lull in the fighting came to an end in late October 2013, when DRC and UN forces launched a series of rapid attacks on M23's core territory. Troops advancing north from the direction of Goma quickly captured Kibumba and Rumangabo, while on the northern front the rebels were forced from Kalengera, Kiwanja, and their administrative headquarters in Rutshuru. Just five days after the fighting began, the DRC army took Bunagana on the Ugandan border, the last town under M23's control. 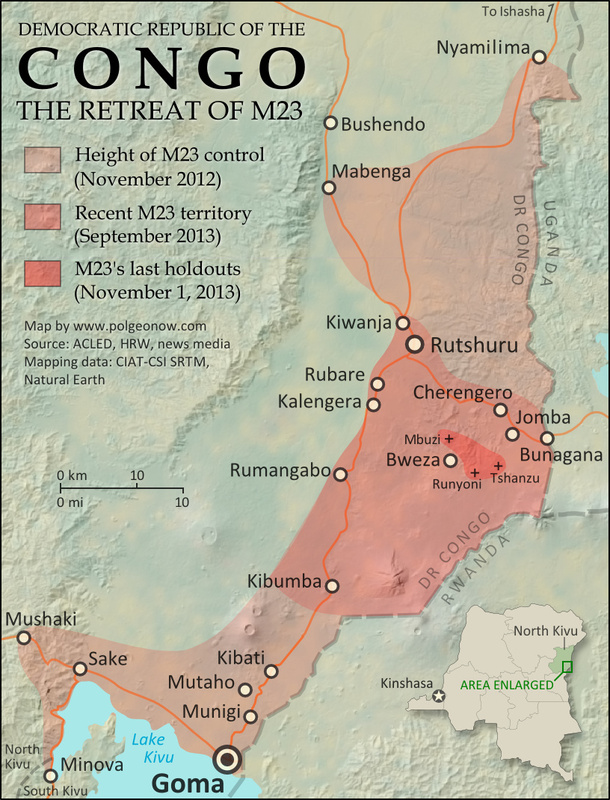 After being driven from all its towns, M23 retreated to a small triangle of territory with positions on the hills of Mbuzi, Tshanzu, and Runyoni. The army pounded the rebel positions with artillery, first taking Mbuzi before finally claiming victory at Tshanzu and Runyoni on November 5. The remaining rebels of M23 surrendered that day to the Congolese forces, ending their 20-month rebellion. Attempts were made to arrange a formal peace agreement, but the DRC government refused to sign anything that might imply recognition of M23 as a legitimate organization. Regardless, the surrender has held so far, and government and UN forces have turned their attention to the many remaining armed groups in the region. Though both countries have staunchly denied it, M23 had well-documented support from Uganda and especially Rwanda, with some reports saying it even took orders directly from the Rwandan government. Rwanda has supported previous Tutsi-led rebel groups as well, often allegedly seeking to combat ethnic Hutu militants who fled to the Congo after perpetrating the Rwandan genocide of 1994. M23's real motives were never perfectly clear, with some suggesting its primary purpose was to maintain a sphere of Rwandan control in the Congo. Likewise, its rapid retreat in October 2013 was likely connected to a loss of support from Rwanda, which had been facing increasing international pressure to end the conflict. 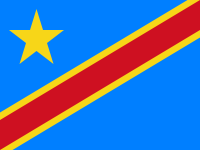 Graphic of the flag of the Democratic Republic of the Congo is in the public domain (source). Map incorporates data from: Jarvis A., H.I. Reuter, A. Nelson, E. Guevara, 2008, Hole-filled seamless SRTM data V4, International Centre for Tropical Agriculture (CIAT), available from http://srtm.csi.cgiar.org.